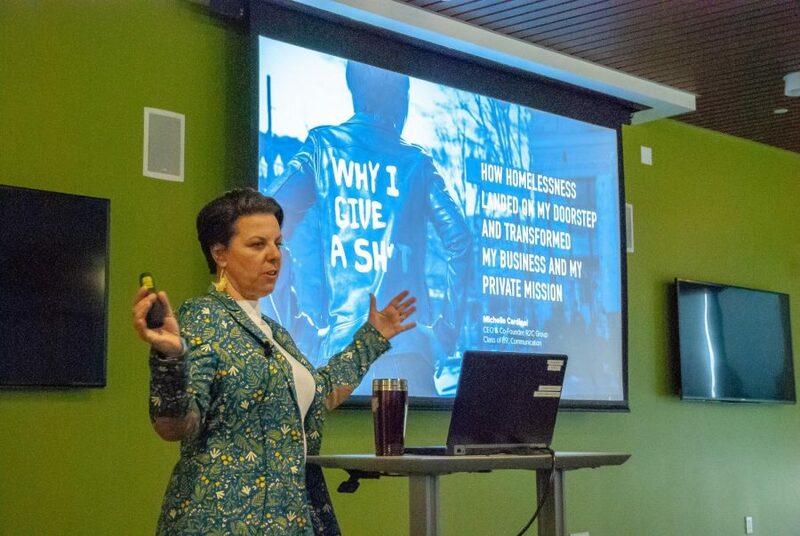 In a talk at the University of Massachusetts on Thursday, Michelle Cardinal, CEO of the privately-owned creative media agency R2C Group, recalled walking down Broadway in the rain and passing an emaciated woman in the middle of a mental breakdown: a neighbor. After more than 25 years working in television sales, advertising and media, Cardinal decided to fight against chronic homelessness in her hometown of Portland, Oregon and beyond. A UMass alum with a degree in communications, Cardinal returned to talk about her realization of the homelessness problem and her expectations for UMass students to keep up with public policy changes affecting the homeless. According to Cardinal, Oregon has 156,000 people at risk of homelessness at any given time due to a lack of savings and sustainable income. Nationally, the U.S Department of Housing and Urban Development published last year that over half a million people are homeless on a given night. In Massachusetts, that number is 20,000 homeless per night: 29 homeless individuals per every 10,000 people — a 14 percent increase from 2017 to 2018 — compared to the national average of 17 per every 10,000. Boston, meanwhile, has a ratio of 91 to 10,000, with 6,000 people on the streets per day. Cardinal named four main factors facilitating homelessness: disabilities, mental illnesses, addiction and a lack of low-income housing. Cardinal credited her mother with obtaining the treatment needed for her twin sister, who has extreme deafness and suffers from mental illness. She has responded by donating to charities working to help the homeless and educating her R2C employees on the true factors of homelessness. That includes urging compassion rather than a stigma of people on the street being lazy or deserving of their poor state. Cardinal also sits on the board of the Central City Concern, a nonprofit organization geared toward putting an end to homelessness through housing services, mental health and addiction aid and more across four separate states. The Oregon-specific organization has been around for 40 years and is the state’s largest homeless nonprofit. After speaking, Cardinal answered questions from several students in the audience, many referencing the financial burdens of college students. Senior Sarah Kahler, a communication disorders major whose mother went to high school with Cardinal, said she has encountered indicators of mental illness and homelessness on campus. UMass anthropology sophomore Tracy’Lee Boutilier also spoke of her advocacy work with marginalized homeless communities, namely communities of color, and about wanting to bring their voices forward. In an interview following the presentation, Cardinal also shared that she wants to get more homeless persons into transitional housing, where they can learn profitable trades. She hopes to start this vocation training program in Portland through funding from one of the major local employers. There are two things left out of this — the breakdown of the extended family and organized religion. She can talk about the homeless (and mentally ill) woman as being her sister — well she is someone’s actual sister, or cousin, and in an earlier age there would have been an expectation of personal responsibility for her. Likewise, 50 years ago, almost everyone in this country belonged to some sort of organized religion, all of which established a sense of collective responsiblity for their members. 50 years ago, the “Great Society” of LBJ served to dump all of this onto government — making everyone responsible with the result that no one is responsible and that is how we got to where we are now. I would like to first off say that Michelle’s talk at UMASS was both riveting and inspiring, and I have seen firsthand the generosity that Michelle extends to not only her own famliy and friends, but to anyone she sees that is in need. She has done so much work for the homeless and other groups that isn’t even outlined here, but is not the type that would boast about her generosity. I was once collecting medical supplies that were desperately needed for Venezuela and Michelle happened to be in from the west coast and appeared at my door, unsolicited, with hundreds of dollars worth of products from CVS. Not many people care as much as Michelle Cardinal, so Dr. Ed, not that it’s your business or that you’d take the time to look into it before you pontificate, but MIchelle adores her twin sister and lives with her much of the year. She brings her to her doctor’s appointments, brings her on her travels and most importantly loves her beyond words. Many, many families try with varying levels of success to help their family members who are mentally ill, drug-addicted &/or homeless. I think until you have gone through it personally, it’s hard to fully understand how difficult it is. I agree that family and faith are important factors in supporting people, but it is not all that is needed. Thanks to Michelle for caring and setting an example for all of us.